Important: Beginning June 2018, the Newsfeed capability will not be available to new Office 365 tenants. At that time, the company feed will also be set to read-only for existing tenants. For news solutions we recommend using team news, communication sites, and/or Yammer. When you follow people, you see the conversations they start in your Newsfeed. Following people also lets you get updates about their activities, depending on settings in their profiles. For example, you can get updates when people start to follow a document, site, tag, or person. Or, get updates when they like newsfeed posts, and when they have events such as birthdays, anniversaries, or job title changes. Note: If you have Yammer in your version of Office 365, the information in this article does not apply. We recommend that you follow people in Yammer instead. For details, see Say hello to Yammer. Following people is a social, community building activity, in the sense that it commonly leads you to discovering other important people and information. For example, a newsfeed item posted by someone you’re following may mention another person relevant to your work. You might then visit that person’s profile and decide to start following him or her. Or, suppose a person you’re following starts following a document, and as a result, you get an update about this activity in your newsfeed. If you then start to follow the document, people following you will get updates and discover this document. If you multiply these scenarios across an organization, it’s easy to imagine how connections among people can proliferate. Typically, you start following people while doing your everyday work. You might also see automated suggestions of people to follow. Finally, if you have particular people in mind who you want to start following, you can search for them. You see this link only for people you’re currently not following. You can start following people who appear in your newsfeed as a result of a variety of activities. For example, if someone is mentioned in a newsfeed post, you can select their name to go to their profile, and then select follow this person. You can search for people directly by name, or you can search for people associated with a topic or keyword. 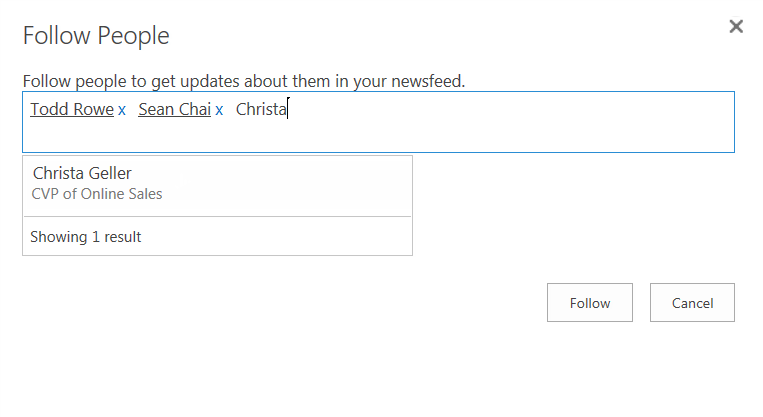 If SharePoint finds the person you’re looking for, you can open their callout and click Follow. On your Newsfeed page, click the number above the “people” label. Click Follow on the People I’m Following page. In the Follow People box, type the names of the people you want to add. As you type, SharePoint searches the list of people in your organization and displays matches as they’re found. Select each person as you see their name. When you’re done adding people to the list, click Follow. Sometimes you may be looking for people in your organization who have some particular knowledge, but you don’t yet know whom to search for. In this case, you can search using words to describe what you’re looking for, and have SharePoint find the people who have this knowledge. Click the navigation menu in the Search box, and then click People. Enter one or more terms in the Search box, and press Enter. Search returns a list of people whose user profiles reference these terms. People who include the term as an “Ask me about” topic are weighted highest, followed by people who list the term as an “Interest”. By default, you see the list of people you’re following. If you want to see the list of people following you, click My Followers. You can stop following people whenever you want to. For instance, if you’re moving to a new team or completing a project, updates about certain people may become less interesting to you. And if you get a lot of updates in your newsfeed, superfluous updates may become distracting. Go to the list of people you’re following as described in the previous section. Find the person that you want to stop following click the ellipses (…) to open their callout. In the callout, click Stop Following. Following people lets you see updates only for the activities they have decided to share with you. Therefore, it’s possible that you may receive no updates at all for some people you’re following, if they’ve disabled sharing updates about their activities. Similarly, when people follow you, they get updates in their newsfeed only about activities you’ve decided to share with them. You set options for sharing your activities in your profile.